Maker Ed is a wonderful new way of thinking about something that’s been around for a while: practical projects or “making”. I love this idea because of my passionate belief in the importance of creating, and of encouraging kids to create at home and at school. Making can be incorporated into different curricula, and maker spaces set up in classroom corners, libraries or be pop-up spaces that enable more fluidity. Materials for making can be as varied as paper, buttons, LEGO, fabric, or clay and as technologically advanced as photopolymer for 3D printing, special kits or books about coding. Many of my librarian friends are embracing, or considering the maker movement, as a logical extension of their emphasis on inquiry-based learning, so I set out to research and find some resources to recommend to them. There are thousands more resources out there, but I have limited my list so it won’t become overwhelming. My thanks go to the wonderful Teacher Librarians on the OZTL list who suggested favourite resources to me. ***How to Build an Epic LEGO Wall - step by step tutorial and free printable. ***The Teen Tech Week Ning - Lots of useful toolkits, particularly Event and Activity Ideas. *** Design Minds - Australian website with this motto: DESIGN IS A WAY OF VIEWING THE WORLD DIFFERENTLY. Lots of Toolkits on offer to prompt your design thinking. ***Renovated Learning - A favourite website among TLs, both those who are contemplating a space and just starting out, and for those who are further along the path. 3Doodler - including 3Doodler projects and design challenges. Pinterest board devoted to Makerspace - Technology, and Makerspace - Arts and Crafts. Life Lessons Through Tinkering - a TED video to show interested staff and parents. There are so many opportunities for learning in Maker Education, particularly when it’s linked to project-based learning, and when the emphasis is on the learning process rather than the product. Is it surprising that do-it-yourself or do-it-with-others far surpasses listening to someone describe how to do something, both in enjoyment and educational outcomes? Is it surprising that kids are hugely motivated to learn when they find a project that fits their current interests and is personally meaningful? Planning, carrying out a task and reflecting on what they did involves children in brainstorming, creative and critical thinking, developing and evaluating knowledge, analysing concepts and ideas, considering alternatives and finding solutions to problems, documentation, innovation, collaboration, and much more. 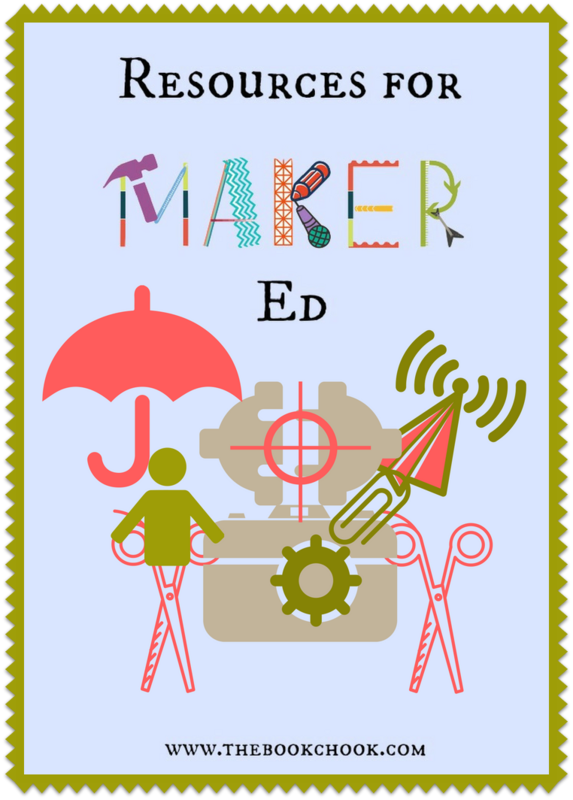 I hope the resources listed above will help you get started with the Maker Ed journey, and that you'll share this post with anyone you think might be interested. On Friday, I will be publishing a list of sample maker activities for kids at The Book Chook. I love Maker Ed's emphasis on "making", especially when this creativity is a follow-up to reading. In my recently published children's book, High in the Sky, a young energetic child hops onto a tire swing and uses imagination to blast into space, surf a roaring wave, soar through the clouds like an eagle and many other fantastic adventures. Ask for this title at your library or go to www.skippingstonepress.net to order your owned signed copy. Also on my website, there are free downloadable instructions for making a paper plate tire swing, plus a free High in the Sky coloring page. Enjoy reading and making!